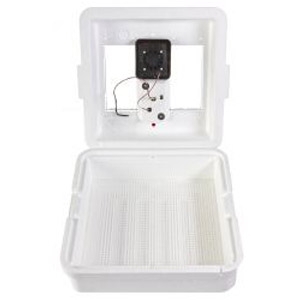 Little Giant® Still Air Incubator | Brazos Feed & Supply, Inc. The tried-and-true way to incubate and hatch eggs, with updated digital technology. Durable styrofoam retains warmth, generated by a gentle heating element controlled by a highly dependable, digital control board. The LCD display with LED light shows accurate temperature and humidity readings instantly. The self-regulating control board adjusts the temperature to suit varying environments. The built-in digital hydrometer and moisture channels help maintain humidity, a key factor in egg health. Plastic mesh screen safely supports eggs during hatch period and is also dishwasher safe. Two 4 inch by 8 inch viewing windows allow for monitoring the hatching process and are great for educational purposes. Holds 41 large chicken eggs or up to 120 bantam or quail eggs when used with the Little Giant Automatic Egg Turner. This product is intended for general poultry hobbyists and is not recommended for professional or commercial use or for incubating exotic birds or reptiles. Automatic egg turner and circulated-air fan kit are available for this incubator, each sold separately.